We keep most of our tomato plants under glass. What is really annoying is that when your plants are looking really healthy, and I’m thinking ‘ hey - success this year’ - along came those sap sucking leafhoppers ! Of course it’s not just tomato plants that these little pests love sucking the life out of. Fuchsias, chrysthanemums, primulas, calceolarias just loads of your carefully protected crops are just as tasty to these little suckers. Living very cosily in the greenhouse all year long. But, don’t you know it, Nature helped us out again ! Don’t ever think wasps are just those pesky things designed to ruin every picnic. As well as those little Encarsias keeping the Whitefly at bay, these tiny Anagrus wasps can really get going on the leafhopper population. Also I just mention, again without comment, that they are mostly female, and can happily lay fertile eggs without any male help at all ! 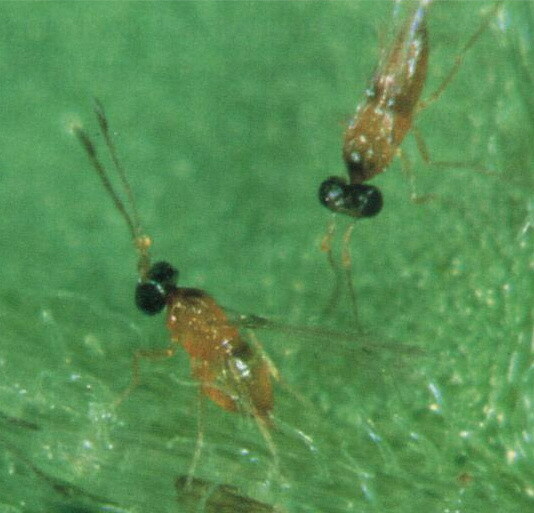 The whole natural cycle works with these busy little creatures laying their eggs on the leafhoppers eggs. But again, I don’t ask for the details, I just eat my tomatoes ! A hundred of these little females will come as pupae on pieces of leaf. You just lay the leaves down, and wait for the Wasps to grow up. Although there will be full instructions included.